20 knots of breeze, gusting to over 25 with seas of up to two metres spiced up the action for the third day of racing at Antigua Sailing Week. It was a wet wild ride upwind but with a sea temperature of 25ºC. Downwind, those who could stay in control came out on top. 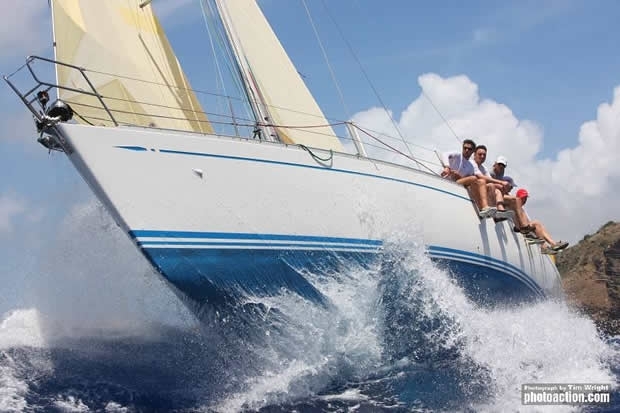 The conditions caused several retirements which have meant changes to overall positions of yachts racing at Antigua Sailing Week. Class I has now become a battle between Hugo Stenbeck’s Dubois 90 Genuine Risk and Richard Matthews’ Humphries 54 Oystercatcher XXVIII. Genuine Risk ripped through the start line off Windward Beach, smashing through the rising seas in an awesome display of power. At 12 knots upwind with green water on the foredeck, Genuine Risk was an impressive sight and Oystercatcher XXVIII was never going to keep up - a real David and Goliath match. Genuine Risk bore away at the top mark and exploded downwind surfing at over 25 knots. Oystercatcher XXVIII hoisted some distance behind Genuine Risk but blew out the spinnaker in the lively conditions. Genuine Risk was literally miles ahead, but a complete hydraulic failure approaching the top mark halted the flying machine’s progress, their canting keel flopping like a pendulum. Oystercatcher XXVIII took full advantage, passing Genuine Risk to take her second win of the regatta and the overall lead in Class 1, but only on countback by virtue of scoring two first places. Lloyd Thornburg’s Gunboat 66 catamaran, Phaedo won both of today’s races in Multihull 1. Her Lamborghini orange hulls were pretty much airborne upwind and hit the turbo downwind, streaking through the surf at breath-taking speed. Phaedo took line honours and two bullets on corrected time by a significant margin. Eduardo Perez-Bengochea’s Gunboat 62 CucuBelle still leads the class, but her advantage has narrowed to just three points. Peter Harrison’s Farr 115 ketch Sojana revelled in the heavy air to win both of today’s races in Class 2. Sojana with around the world yachtsman, Brian Thompson on board, is now class leader, overtaking Carol Swift and Stefan Lehner’s Passion 4 C. Paul Fevang’s Swan 66, Godot remains third overall. Phillip Lotz’s Swan 42 Arethusa sailed well in the tough conditions, especially downwind. Arethusa’s distinctive red and white spinnaker was easy to spot as the American boat took off downwind in perfect control and it now leads Class 3. Dig Van Der Slikke’s Grand Soleil 43 D-Trip was top of Class 3 this morning but had to retire during the first race of the day with rudder failure. However the Dutch crew returned to Falmouth Harbour and after a hasty repair, came back to win the second race of the day. But the retirement has cost them the class lead. James Dobbs’ J/122 Lost Horizon had a consistent day to hold third place. Richard Weslund’s J/120 El Ocaso and Steve Crooke’s Puerto Rican team on their First 40 Smile and Wave was a sensational sight surfing downwind today to score their first podium finishes of the regatta. In Class 4, Calvin Reed’s First 40.7, Elandra was in fine form, yet again. After a highly competitive first beat with the front-runners in their class, Sir Hugh Bailey’s Hugo B and Carlo Falcone’s Caccia alla Volpe. Elandra is top of the class with Caccia alla Volpe second. Hugo B had gear failure today and retired before completing the first race. OnDeck’s First 40.7 Spirit of Athena moves up to third overall. Jonty Layfield’s immaculate Swan 44 Sleeper had a hiccup in the first race of the day with a lowly fifth, but came back strongly to win the second race and retain the Class 5 lead. Gennaro Aversaro’s First 47.7 Alcor V posted a first and a third today to retain second place overall with Andy Middleton’s sistership Global Yacht Racing still third in class. Peter Bainbridge’s J/122 Sky Hunter II handled the conditions extremely well, to post two bullets today, propelling them above Geoffrey Pidduck’s Six Meter Biwi Magic for the overall lead in Class 6. Peter Lewis’ J/105 Whistler did not start the last race of the day and slipped out of the top three overall as a result. Thomas Mullen’s J/95 Shamrock VII scored two podium finishes today and moved up to third in class overall. It was great to see local favourite Sandy Mair back on the race course today, after his boat Streaker was holed yesterday. Class 7 is proving to be one of the most competitive classes at Antigua Sailing Week. Although Rick Gormley’s First 38 is well ahead on points, every race has been a close affair. Tanner Jones’ J/30 Blue Peter scored a first and a third today putting them into third overall. Bernie Evan-Wong’s Cal 40 Huey Too has yet to win a race, but consistent results means that the Antiguan boat is second overall. Elthea has a commanding lead but a dead-heat on corrected time with Stephen Carson’s, Dehler 34 Hightide today, just goes to show the hot competition in this class.